Whether storing agricultural chemicals, medical wastes, chemical drums, or household hazardous wastes, outdoor hazmat storage buildings are critical to benefiting human health and the environment. There are a number variables to take into consideration when storing hazardous materials. Outdoor hazmat storage building choices depends on the type of hazmat that is going to be stored, the climate in which it is going to be stored in and the location of the outdoor hazmat storage building. In the chemical industry there are many different types of chemicals, and classes of chemicals. It is necessary to identify what type of chemical you are storing and the hazardous class is associated with each chemical. There are two main categories of chemicals, flammable/combustible and non-flammable. Recognizing the chemical’s hazard class determines the type of hazmat storage building is necessary. When storing non-flammable chemicals, including corrosives and toxic materials, a non-fire rated chemical storage building is ideal. If you are storing flammable and combustible substances, a fire-rated building with featured explosion proof accessories is necessary, depending on where the building is located. The type of hazmat storage building that is selected is dependent on your location and your operations. Outdoor hazmat storage by US Chemical Storage offers a unique customizable design that allows you to store large quantities or small quantities of hazmat storage compliantly. Our sales engineers will walk you through safety regulations and compliance requirements in order to provide the safest chemical storage solution for your hazmat storage. Outdoor hazmat storage buildings by US Chemical Storage meet EPA, OSHA, NFPA and FM or Warnock Hersey approvals for maximum safety. Hand-welded from heavy-gauge steel by experienced, certified welders and designed by our professional engineers. 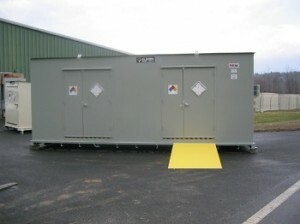 These outdoor hazmat storage buildings are built for industrial use and are made to last. All US Chemical Storage buildings are tested before leaving our factory to ensure the safest and most dependable storage solution available. A wide variety of safety accessories are available to make your outdoor hazmat storage building 100% compliant. Available safety options include explosion proof and non-explosion proof accessories. Our outdoor hazmat storage buildings feature a 15-year structural warranty and a leak-proof secondary containment sump to contain chemical leaks, spills or hazardous accidents that may occur. Our buildings are built from heavy-gauge steel for unmatched strength and are 100% compliant and 100% customizable. What is a secondary containment sump? According to the EPA, “A secondary containment system provides an essential line of defense in the event of a failure of the primary containment, such as bulk storage container, a mobile or portable container, piping, or oil-filled equipment.” US Chemical Storage implements sump containment systems in our chemical storage buildings to keep personnel, investments and the environment safe from hazardous accidents. Our secondary sump containment systems are leak-proof and designed to keep your hazmat and the environment safe. Will the location affect the type of building I choose? Depending on what type of building construction is selected, the distance from occupied facilities will vary. Contact your local fire Marshall regarding proximity requirements. If you are storing flammables or combustibles it is required to locate your outdoor hazmat storage building 30 feet or more away from an occupied facility. There are many different safety accessories available to your outdoor hazmat storage building. View our wide range of accessories on the web or contact one of our professional sales engineers to learn more.